Dogs are not just animals, but part of our families. They watch infants grow into toddlers, wait anxiously for kids to return from their first day of school, and say a bitter sweet good-bye with mom and dad watching their best friend leave home for college. 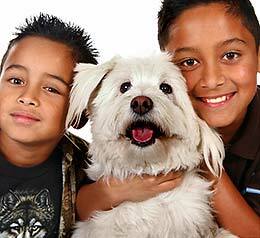 While the emotional ties are strong, it is important to be smart whenever kids and dogs are together. 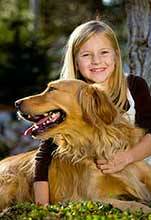 Dogs are first and foremost animals and need to be understood as such, especially when part of a family with children. It would be pretty easy to just give you a list of dog breeds that are known to do well with children, and in fact, we will do just that at the end of this article. However, that would be doing you, your kids, and your dog a great disservice. Did you know that four out of every ten families who get a dog give that dog up within the first year? Many times, this is because the dog does not suit the family's lifestyle and personality. Your dog will become an important member of your family, so you need to make sure you are giving your decision the proper consideration. Think of it this way. If you went out to buy a new car, you might head to the Mazda dealership because you have had a good experience there before. But would you just walk into the showroom and tell the salesperson to give you whatever car he thought would be good? No, you would buy a particular model because it suited your lifestyle and / or personality. If you have three kids, you might go for the MPV minivan. If you are empty nesting or having a mid-life crisis, you might go for a Miata convertible. Or maybe you need a sedan for business travel. Will the breed you choose be tollerant of that? No less care should be taken when deciding on a dog. You must take the time to look into grooming and exercise requirements, activity level, temperament, and trainability. 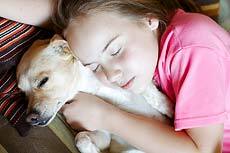 Particularly with kids in the house, you will need to find a dog that is patient and tolerant of annoyances. No matter how well-behaved your children or grandchildren are, it is likely they will do something at some point to annoy the dog. You must make sure that the dog will not lash out at them when this happens. The Humane Society of the United States estimates that 50% of all children will be bitten by a dog before the age of 12. Most times, it is not a strange dog, but rather the family's own pet or a neighbor's dog. Surprisingly often, bites are not a result of maliciousness or viciousness on the dog's part. You may think your dog would never, under any circumstances bite someone, but you must remember that dogs will be dogs, no matter how well trained they are. To give an example, Kayla is a mixed breed dog that lives in a home with three developmentally disabled, very rambunctious boys. There are also four other dogs in the home. Although Kayla has at times raised her shackles towards the other dogs, she has never shown any signs of aggression to the boys or to other guests in the home. One day, a babysitter came to the house, bringing along her 10-year old daughter. The daughter sat down on the couch and snuggled with Kayla while eating a toaster pastry. Kayla began licking crumbs from the girl's lips, then without any warning, bit the girl, resulting in 10 stitches to her lip. It is likely that Kayla thought the lip was part of the snack and was not acting maliciously, but the result was the same - the child will be permanently disfigured as the result of a dog bite. Dogs react to situations like we humans do. Dogs react to situations out of instinct and according to their own perceptions, just as humans do. Have you ever slammed on the brakes in your car and reached across the seat to hold your child back, even when the child wasn't there or even when you were nowhere close to hitting anything? You likely acted on the instinct to protect your child, as well as on your perception that a crash was imminent. A dog does the same thing. His instinct is to protect his turf, both the property and the people therein, as well as himself. His perception of a threat to turf, property, or self is likely very different than your perception. As a human, you recognize the difference between the mailman and an intruder, but think about it from your dog's perspective. Both come near the front door and leave when the dog barks. How is he supposed to know that one is welcome and the other is not? Many dogs have a powerful predatory instinct. Hunting is, after all, how their ancestors fed themselves. How does the dog know the difference between a small animal (dinner!) running across the yard, and a small child running across the yard? Dogs who are protective are not likely to be able to distinguish between the screams of play and screams of fear your child may use. This doesn't just apply to small children. Lady, a collie who had lived with Carol for 6 years, was outside during a snowball fight between several teenagers. One of the boys tackled Carol, who was 16 at the time, and began "washing" her face in the snow. When Carol screamed, Lady bounded over and bit the boy, trying to tear him away from Carol. Was she being vicious? Of course not; she was simply acting on instinct to protect her family. Herding dogs make their living by nipping at the heels of animals to keep them in line. It should not be surprising that they may nip at the heels of the children in the family. Many dogs have even been known to help the parents discipline a child by herding the child into her room when she misbehaves! Although you can never fully overcome a dog's instincts, you can work on obedience and socialization to curb his behavior and make it less likely he will bite. If you get a puppy, that dog should be taken nearly everywhere you go for at least the first six months. Clearly, you won't be able to take the dog inside the grocery store, but if you can, take him with you and have one member of the family stay outside with him, talking to people as they come by. Let him get used to strangers, noise, and confusion. Take the dog to obedience school so he will obey your commands EVERY time. Make sure the dog knows who the master is by controlling meal times and making some of the furniture off limits. Even if you don't care if the dog gets on the bed, you need to make sure he understands that you are in control and that there are rules he must follow. You can do this by making him wait to get on the bed until you call him, hopefully AFTER you have claimed your own spot! Teach your pup, and your kids. Give the dog a place to call his own.Whether this is a crate or a pen in the backyard or a blanket on the floor of the basement, he needs his own space.Teach your children to stay away from him when he is in his den. Never leave a dog alone with a child under five years old.Neither of them understands the other well enough to prevent accidents. Teach your children and their young guests how to behave around dogs:letting the dog get to know them by sniffing, avoiding sudden movements and high-pitched screams.Children should be taught not to stare at a dog.Dogs consider staring an act of dominance and aggression, so they are much more likely to feel challenged if the child is staring at them. 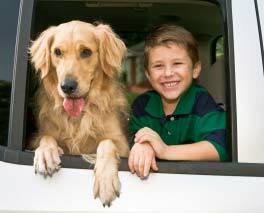 As your child gets older, teach him the obedience commands for the dog and make sure the dog understands that the child is also above him on the totem pole. As this article has hopefully made clear, it is important to consider not only the specific breed of dog you will choose, but also the dog's individual temperament and how it might fit into your family structure.With these caveats, here is the list for breeds that are known to be good with children. This will at least give you a starting place as you search for the specific dog that is perfect for your family. Beagle: He is very pack-oriented and sociable.Beagles enjoy attention, rough-housing, and playing ball.They are patient with children, but children must be taught not to leave doors and gates open – beagles LOVE to roam! Bernese Mountain Dog: This sweet, gentle dog needs companionship; he can be your child's best friend.However, his size is a concern, especially around very small children. His tail alone can wag hard enough to knock over a toddler! Bloodhound:This kind, patient dog loves the attention children provide.You must teach your children not to pester the dog, because the bloodhound will just sit there and take it.Make sure the dog gets some alone time to decompress. Boston Terrier: Though the breed was originally developed for dogfights, this dog has since been selectively bred to be a less aggressive breed that is great with children.The Boston is very intelligent and will love to play with your child. Boxer: This breed is very people-oriented and craves the human companionship your child can provide.However, young boxers are VERY rambunctious and may be too much for a young child to handle. Collie :Collies are intelligent, sensitive and gentle.In fact, they are almost never used as police dogs because it is so hard to get them to bite someone! Foxhound: Both the American and English varieties get along very well with children. Golden Retriever: The quintessential family dog.Goldens are known for their patience and tolerance to just about anything a child can bring.Their extreme need for constant attention usually matches a child's need to constantly play with them. Great Dane: If you have a lot of space in your home, you might consider a Great Dane.This mammoth dog (think Marmaduke or Scooby Doo) is very gentle, but just because of his size, care should be taken around young children. Labrador Retriever: The most popular breed in America, the Lab is excellent with children.Young Labs are VERY rambunctious – you might not want to take on a Lab puppy while your children are very small. Mastiff: Another gentle giant.If you have room in your home and your children are old enough not to get caught underfoot, the Mastiff may be a good choice for you. Newfoundland: The Newf is very gentle and loves children.His patience and tolerance for being pestered actually led to a clinical study using this breed in therapy for hyperactive children. Old English Sheepdog: This playful breed has been nicknamed the "babysitter" because they are so good at herding children, a trait passed down from the old days when the Old English was used to herd sheep. Pug: Very fun-loving and playful, the pug always loves a good romp with the kids of the house.He is likely to walk away rather than lash out when he's had enough. St. Bernard: Another massive breed that is great with children.St. Bernards are very affectionate and love to give big, sloppy kisses. Standard Poodle :In contrast to the toy and miniature poodle, the standard, or big, poodle is excellent with children. Vizsla: This lesser known breed is very active and loves to play.He is a great companion for your child. It is impossible to over-stress the importance of looking for a reputable breeder who pays attention to things like temperament when picking breeding partners. After living with the dog for six – eight weeks, the breeder should be able to tell you which of the dogs in the litter have the personality traits required to be good with children. Spend some time with the puppies to see if you agree with the breeder's assessment before making your final decision. If you are getting an adult dog, perhaps from a shelter, you will also want to spend adequate time with the dog before taking him home, to see how he reacts to your family.